This week's challenge at Die Cuttin' Divas is a color challenge. I wasn't quite sure what to do for this challenge, so I started by adhering my 1" yellow and orange square scraps in a checkerboard pattern to a white piece of paper and cutting it to the size I wanted. Ran that through my Sizzix using the Cuttlebug Tiny Mosaic embossing folder. This card is A2 size. The stamps are Inkadinkadoo $1stamp set. The ticket die cut is from Art Philosophy cartridge. Popped the tickets up on foam squares, added some purple crinkle ribbon and 3 purple heart brads. I'm going to call the inking grey, well it's close! I'm thinking this card could be used for an anniversary or birthday card. 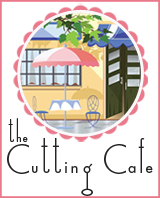 Our sponsor this week is the Cutting Cafe. Thanks for stopping by; we look forward to seeing what you create! What an adorable card! Love those little heart brads and the embossing is great! Beautiful card. Love it !! Your ticket stubs are super cute Pat. Great job combining these colors. I really like your embossed background that you created. Looks great! I love the colors and the embossing.